Workout: Warm [2 mi. ], 3 miles @ 6:26 pace, Cool [2 mi.] Weather: 66 degrees, cloudy. Same distance workout as last week. 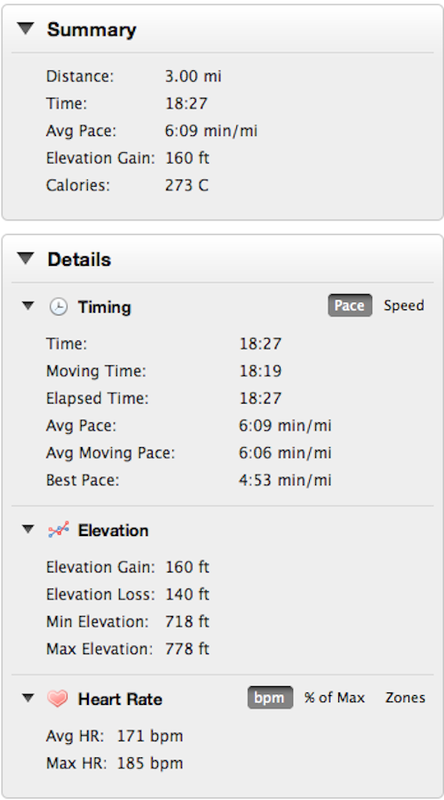 Only moved the goal pace from 6:29 to 6:26. Didn’t really want to do anything special outside today. Just wanted to get this one done and put another run in the log. I was a little concerned because yesterday’s (Monday), 9-mile easy run was a little tougher than I thought it should have been. The runs for the past three weeks or so have been great, but I’m wondering how long could it last. When’s the plateau going to begin? The warm up was easy (didn’t take much out of me), so I figured I was good to go from the start. Yes, finally, a tough run that I knew I could complete before the hard stuff began. The chief battle with today’s run was impatience. I just wanted the dang thing to end. One thing I’ve found lately, that’s useful to distract myself from running. I do math in my head, for instance. Today, played a game where calculated how much time I had left every 30 seconds. So, for 30 seconds, I wouldn’t look at my watch and then I’d try to figure everything out. Not the most sophisticated stuff but a nice challenge while running. Really didn’t have a problem finishing today at 6:21 pace. Motivation. I had a thought last night as to why I continue to do this. I think part of it is just a little experiment. If I do this and this and this, what will happen tomorrow? I don’t think it’s the goal that motivates me, even though a 5K personal record in December would be nice. It’s the day-to-day that’s fascinating. Completing a workout I didn’t think I could do. Making an old workout easier. Seeing improvement and knowing that I had some conscious input in that improvement. Reminds me of planting flowers in a cup in kindergarten class. It’s fun to see things grow. Workout: 3 miles @ 6:30 pace; core work. Weather: 70 degrees, partly cloudy, wet. Recap: Didn’t feel good this morning. A little nervous about things to do. Three-day weekends will do that I guess. Got out there on the road after some delay. It felt tough (high humidity), but the heart rate was the same as yesterday. Surprises. Maybe that will start off a good Tuesday. Love reading you guys’ posts too. Keep it up. Have a great day and thanks for reading. 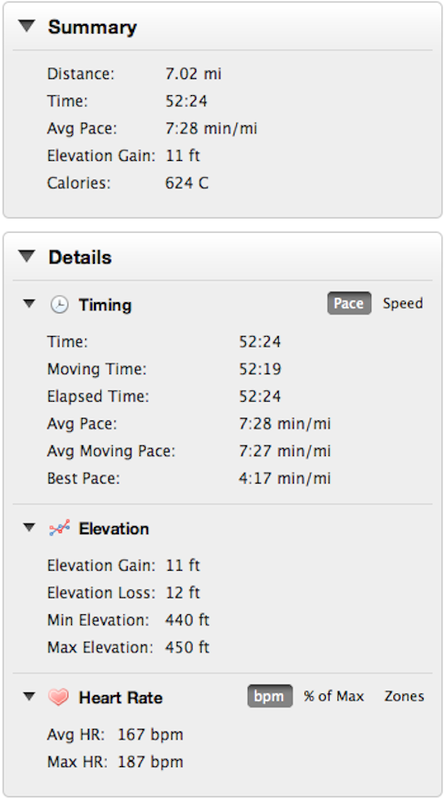 Easy Run: 4 miles @ 7:42 – 6:44 pace. Whew. Rough day. Not rough running… just a little stressful otherwise. Had a little work to do and too many thoughts. I didn’t want to run. But off came the PJs and out the door I went about 7 p.m. The pace felt easy enough. HR was a little up on the run, but 97% humidity will do that every time. On the positive front, morning HR was 47 bpm. It’s coming down! Happy about that. I think I’m finally starting to get the rest that I need as the academic semester draws to a close. (1) My goal is to inspire. How? I intend to get faster, and I want to leave a record as to how it happened. A day-to-day record. Thought processes…training…motivation…good days and bad days. The next person will see it and know how at least one person did it. That person can do it too…probably in a shorter amount of time after looking at my mistakes. (2) I like to be encouraged and to encourage as well. For every person who distrusts runners’ ambitions, there’s another person looking to interact with other runners and fit freaks in general. It’s been great the last two weeks meeting more people on Twitter who exercise. There’s a lot of positive feedback going all over the place…people posting their workouts and others telling them to keep going. Sounds like a group of folks I’d like to hang around in general. Keep sharing your work (even those outside of fitness). Someone will be inspired. Happy that I even got out there. Ate a triple-meat Baconator from Wendy’s after school. Took a shower. Got in bed. Told myself it was OK to miss a day just to rest. Then I crawled out of bed and ran at 10:15. I’m not sure what the motivation is: this blog, my own personal training log or whatever, but it’s pretty cool. Another ho-hum type of run. But it felt pretty good. Focus today was running tall. Getting upright. Made the run feel really easy at the end. Kind of anxious about tomorrow morning’s interval run. It’s been two weeks since I’ve run with any kind of speed. We’ll get to see if I can hang on here. Also, probably going to start taking Sundays off. 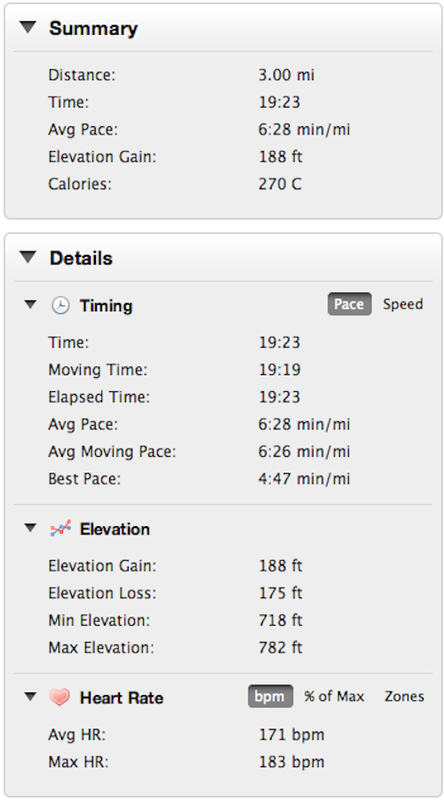 Just add up the mileage that I would have done Sunday and distribute it among the easy runs. Too many close calls with these night runs. Might be burning out mentally. Probably means the same physically.